Space-farmer Rae Darling is kidnapped and trained to become a warrior against her own people in this adventurous middle grade space western. Rae Darling and her family are colonists on a moon so obscure it doesn’t merit a name. Life is hard, water is scarce, and the farm work she does is grueling. But Rae and her sister Temple are faced with an added complication—being girls is a serious liability in their strict society. Even worse, the Cheese—the colonists’ name for the native people on the moon—sometimes kidnap girls from the human colony. And when Rae’s impetuous actions disrupt the fragile peace, the Cheese come for her and Temple. Though Rae and Temple are captives in the Cheese society, they are shocked to discover a community full of kindness and acceptance. Where the human colonists subjugated women, the Cheese train the girls to become fierce warriors. Over time, Temple forgets her past and becomes one of the Cheese, but Rae continues to wonder where her loyalties truly lie. When her training is up, will she really be able to raid her former colony? Can she kidnap other girls, even if she might be recruiting them to a better life? When a Cheese raid goes wrong and the humans retaliate, Rae’s loyalty is put to the ultimate test. Can Rae find a way to restore peace—and preserve both sides of herself? Did you read the synopsis? Every word of it? Do you see what I mean? The moon in this story has been colonized. The native people who lived there are called "the Cheese." They kidnap girls from "the human colony." So... are the Cheese not human? The Cheese kidnap the women to turn them into warriors who will fight against with the Cheese--against the humans. Rae and her sister find out that the Cheese treat women better than the humans did. IS THIS ALL SOUNDING FAMILIAR TO YOU? I need one of those images of face palm, or head desk. Or a cool GIF. Daniel José Older always tweets some excellent ones. Where does he find those, I wonder?! Red Moon Rising is out this year, from... Wait for it... A major publisher! It is from Margaret K. McElderry, which is an imprint of Simon and Schuster. That is one of the Big Five! Big bucks for the author, big bucks for the promo of the book. I'm certainly being cynical in what I've said. Maybe I'll regret it. Maybe this book is gonna rock. Author Martha Brockenbrough submitted a comment, noting that my use of "big bucks" suggests that people can make a living with their writing. I'm glad for her note. Being published by a big house does give writers a huge leg up in terms of visibility of their book, but it doesn't mean the writer can quit their day job(s). That could come later, after a lot of success and a lot of work, but it isn't the norm. Joseph Johnson has lost just about everyone he's ever loved. He lost his pa in an accident. He lost his ma and his little sister to sickness. And now, he's lost his pony-fast, fierce, beautiful Sarah, taken away by a man who had no right to take her. Because Joseph Johnson may have lost just about everything. But he hasn't lost hope. And he hasn't lost the fire in his belly that says he's getting his Sarah back-no matter what. The critically acclaimed author of The Honest Truth returns with a poignant, hopeful, and action-packed story about hearts that won't be tamed... and spirits that refuse to be broken. "She's half Indian pony, so she's got some spirit, but she ain't nothing but perfect with me." "It was Indians. [...] The boy's eyes narrowed. He bared his teeth like a wolf and snarled a word low and mean in his native tongue." I will try to get a copy to read/review. If I do, I'll be back! You remember those Scholastic catalogs your teachers would pass out from time to time? Thinking about them is a powerful memory--for me--because I loved reading. I still do! I was a kid in the 60s. I wish I had one of those catalogs now, so I could see how the books I chose from compare to those in this year's catalogs. American Indians in Children's Literature is part of the #StepUpScholastic campaign that invites parents, students, teachers, librarians--anyone, really--to study the books Scholastic offers in their flyers (they say flyer, some say catalog, others say club forms). Once you study a flyer, you can write a letter to Scholastic telling them what you were looking for, and what you found--or didn't find. I'm looking for books by Native people, but if I see a good one about Native people that is written by someone who is not Native, I'd buy it. On the first page, I see Happy Valentines Day, Little Critter. I bet the Little Critter Thanksgiving book was in their November catalog. I wouldn't get that one. In fact, I have it on my "not recommended" list. On the second page, I see a Pete the Cat boxed set. I bet the November catalog had Pete the Cat's Thanksgiving book. It, too, is on my "not recommended" list. There's a Pinkalicious set, too. I bet the Thanksgiving catalog had the Pinkalicious Thanksgiving book... Also, not recommended. So what did I find? No books by Native writers; no books about Native people or with Native characters. Native people--good or bad--are completely missing from this flyer. On page three, I see Stuart Little. It kind of has an image of a Native person. In that book, Stuart imagines an Indian paddling in a canoe. On page four there's a set of all the Junie B. Jones books. My guess is that it includes Shipwrecked which has the kids doing a play about Christopher Columbus. Turkeys We Have Loved is about Thanksgiving, and it has the kids doing a play about Thanksgiving. One girl is dressed up as a Native American. What did I find? No books by Native writers; one character playing Indian. On page three is Polar Bear Patrol in the Magic School Bus series. In it is Dr. Luke, an Inuit scientist who teaches the kids about the Arctic and that he prefers Inuit to Eskimo. On page five is the Junie B. Jones Shipwrecked that was in the Kindergarten catalog. I found no books by Native writers; one character who is Inuit. I don't have that book on my shelf so can't tell if the depiction of Dr. Luke is one that is free of bias or stereotyping. On page two are boxed sets of the Magic Tree House books. One is Thanksgiving on Thursday. There's a Native character in it. You know which one, right? Squanto! The stories told about him are pretty much a whitewash of what his life really was, but Thanksgiving on Thursday took that whitewashing to a whole new level. Another book in the series is Buffalo Before Breakfast. In it the Jack and Annie travel to a Lakota camp. There are many errors in that story and the part where the wise Lakota grandmother gives Jack and Annie an eagle feather? That doesn't work at all, because when they travel back to the present day, having that eagle feather is a violation of federal law. No books by Native writers; a handful of stereotypical Indians and some factual errors. I'll have to find time to look through the catalogs for third, fourth, fifth, and sixth graders. And the seven different catalogs in their "Wider" selection category. And the four in their "Special Collections" category. I am looking for books by or about Native peoples. 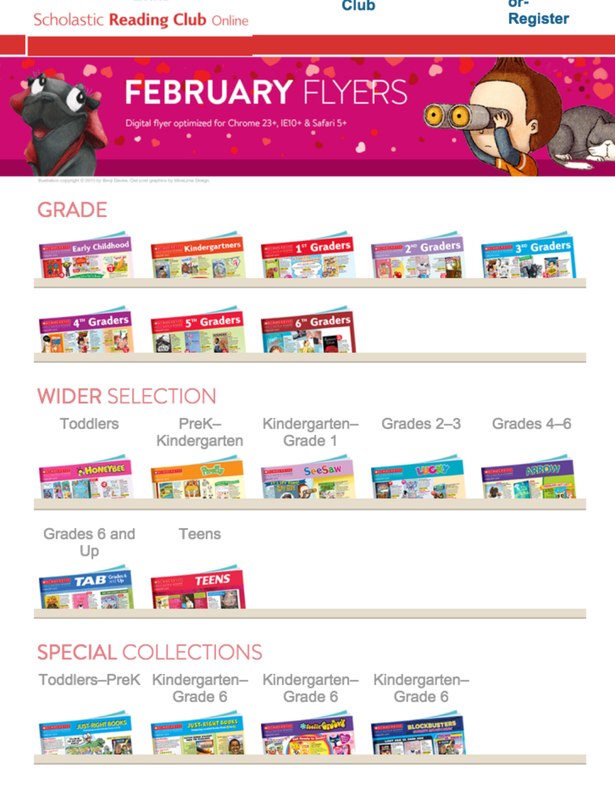 When I looked through your preschool, kindergarten, first, and second grade flyers for Feb of 2016 I found no books by Native writers or illustrators. NONE. ZERO. Magic School Bus: Polar Bear Patrol by Joanna Cole might be ok. If I find a copy, I'll be back with an update. Will it be the one book out of 410 items on the order form that I would buy? Out of 459 books, none are by Native writers or illustrators. Please, Scholastic, you can do better than that. All children ought to learn the names of Native writers and illustrators, and their respective nations, too! You, Scholastic, tell us that you have children's interests at the core of your company and what it publishes. I see lot of room for improvement. #StepUpScholastic. Do better. People are already submitting letters. You can see them at the Tumblr page for the campaign. Please join this effort to get more diversity in Scholastic's catalogs. Out this year from 7th Generation is Joseph Bruchac's The Long Run. It is in their PathFinders series. Follow Travis Hawk on a cross-country trek as he escapes a world of brutality and uncertainty and puts his trust, and even his very life, in the hands of total strangers. Travis's story is one of struggle, survival, risk and resilience, navigating a solo journey of hundreds of miles to seek a safe haven far from the demons of his past. I'll be back with a review! A reader sent me a copy of Michelle Modesto's Revenge and the Wild. Published in 2016 by HarperCollins, here's the synopsis. True Grit meets True Blood in this delightfully dark and fantastical Western perfect for fans of Gail Carriger, Cassandra Clare, and Holly Black. This thrilling novel is a remarkable tale of danger and discovery, from debut author Michelle Modesto. The two-bit town of Rogue City is a lawless place, full of dark magic and saloon brawls, monsters and six-shooters. But it’s just perfect for seventeen-year-old Westie, the notorious adopted daughter of local inventor Nigel Butler. Westie was only a child when she lost her arm and her family to cannibals on the wagon trail. Seven years later, Westie may seem fearsome with her foul-mouthed tough exterior and the powerful mechanical arm built for her by Nigel, but the memory of her past still haunts her. She’s determined to make the killers pay for their crimes—and there’s nothing to stop her except her own reckless ways. When I get a chance to read it, I'll be back. I don't know if westerns are seeing an uptick of late. I'm definitely seeing them, but they may have been out there a long time and I didn't know about them. I don't mean historical fiction--I mean westerns, which as a genre, feel different to me than historical fiction. In the Choctaw Nation, Indian Territory, in the year 1900, friendships between children of white “intruders” and their Choctaw and Chickasaw schoolmates had to cross a deep cultural divide. It was also a time when public ignorance could make a mockery of the ambitions of a boy with dwarfism and a place where children had to grow up fast. Trouble begins when a beautiful wild stallion, a supposed man killer, is rescued by two adventurous young brothers. When the stallion is identified as a rare Choctaw horse, the question of who should own him threatens to destroy cherished friendships. Then a courageous decision by a young boy allows the ancient spirit of Buster, their Choctaw Pony survivor, to live on for future generations to love and respect. If I am able to read it, I'll be back with a review. 1874, the U.S. Army sent troops to subdue and move the Native Americans of the southern plains to reservations.Brothers of the Buffalo follows Private Washington Vance Jr., an African-American calvaryman, and Wolf, a Cheyenne warrior, during the brief and brutal war that followed. Filled with action and suspense from both sides of the battle, this is a tale of conflict and unlikely friendship in the Wild West. I'll put it in my to-read pile. It is being marketed as for kids in grade 7 and up. This is a list of books I read in 2015, sorted into categories of Recommended (total of 16), and Not Recommended (47 in all). As you see, it is not a list of books that came out in 2015. Grand total: 60 (and counting). There is one writer on the recommended list who is not Native (Daniel José Older) and one on the Not Recommended list who is Native (Tara White). Links go to my review on AICL, and some of the links go to my article at School Library Journal. This is not a comprehensive list. There are books that I bought or received but wasn't able to read or finish writing up. One example is Ann Martin's Claudia and the First Thanksgiving. That's a book in the Babysitters Club series. It was one that will end up with a Recommended tag when I write it up. Paquette, Aaron. (2014) Lightfinder. Published by Kegedonce Press. Shuck, Kim. (2005). Smuggling Cherokee. Published by Greenfield Review Press. Smith, Cynthia Leitich. (2001) Rain Is Not My Indian Name. Published by HarperCollins. Anderson, Teddy. (2014) The Medicine Wheel. Published by Medicine Wheel Education. Bader, Bonnie. (2013) Who Was Christopher Columbus? Published by Grosset & Dunlap, an imprint of Penguin. Benet, Rosemary. (1933/1987) A Book of Americans. Republished in 1987 by Henry Holt. Blyton, Enid. (1944) The Boy Next Door. Published by Angus and Robertson. Boone, Martina. (2014) Compulsion. Published by Simon Pulse, an imprint of Simon and Schuster. Cromwell, Ellen. (2015) Talasi: A Story of Tenderness and Love. Published by Halo Publishing International. Danforth, Emily M. (2012) The Miseducation of Cameron Post. Published by Balzar + Bray, an imprint of HarperCollins. DeBrunhoff, Laurent. (2008) Babar Comes to America. Published by Abrams. Federle, Tim. (2013) Better Nate than Ever. Published by Simon and Schuster. Goble, Paul. (1992) Crow Chief. Published by Orchard Books. Greenwood, Mark. (2014) The Mayflower. Published by Holiday House. Jenner, Caryn. (2012) Pocahontas. Published by Dorling Kindersley. Keene, Carolyn. (2010). Nancy Drew and the Clue Crew: Camp Creepy. Published by Simon and Schuster. Keene, Carolyn. (2012) Nancy Drew and the Clue Crew: Thanksgiving Thief. Published by Simon and Schuster. Krull, Kathleen. (2007) Pocahontas: Princess of the New World. Published by Walker Publishing. Kyle, Chris. (2012) American Sniper. Published by William Morrow. Rex, Adam. (2007) The True Meaning of Smekday. Published by Hyperion Books for Children. Rey, H. A. (1963/2013) Curious George Learns the Alphabet. Published in 1963 by Houghton Mifflin. Scarry, Richard. (1961) Tinker and Tanker: Out West. Published by Doubleday. Thomas, Cookie. (2014) Cinnamon and the Bat People. Published by TMC London. Warner, Gertrude Chandler. (1993) The Mystery of the Lost Village (Boxcar Children). Published by Albert Whitman & Company. Wilder, Laura Ingalls. (1940) The Long Winter. Published by Harper and Row. Wiles, Deborah. (2014) Revolution. Published by Scholastic. Here's my Recommended/Not Recommended List for 2014. Last year, there were 26 books on the Recommended list, and 35 on the Not Recommended list. Grand total then: 61. When I look it up online using "Calkins Creek," I'm directed to Boyds Mills Press. Sometime I ought to find out how all this "imprint" thing works! Sixteen-year-old Noah Daniels wants nothing more than to fight in George Washington’s Continental Army, but an accident as a child left him maimed and unable to enlist. He is forced to watch the Revolution from his family’s hard scrabble farm in Upstate New York—until a violent raid on his settlement thrusts him into one of the bloodiest battles of the American Revolution, and ultimately, face to face with the enemy. A riveting coming of age story, this book also includes an author’s note and bibliography. From the Kirkus review, I see that Scar is "a wounded Mohawk soldier allied with the British" and from SLJ's review, I see that it "sheds light" on the "Iroquois Confederacy's alliance with the British." That's all I have for now. When I read it, I'll be back with a link to a review.